Wow! We collected a lot of food for needy families. A great big giant “thank you” to Mt. Helix Academy families and staff who contributed a total of 1,353 pounds of food toward our food drive that will benefit Feeding San Diego. According to Feeding San Diego, the Mt. 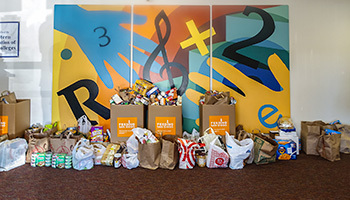 Helix Academy donation will create 1,127 meals to be delivered in their Mobile Pantry program, which delivers food to high poverty neighborhoods where people lack transportation, and in their School Pantry program, which helps alleviate hungeer for low-income students and their families. We at Mt. Helix Academy could not be more proud and more thankful for you and your generosity.